When Westcott Elementary School principal Monique Dockery received a phone call from Chance the Rapper this Sunday, she didn&apos;t recognize the number. "He was like, &apos;I just want to come out, if you would have us in Westcott. I need to make an announcement.&apos;"
The next afternoon, after a sudden announcement from Chance&apos;s Twitter account, local news media and national publications—including Fader, MTV, Rolling Stone, and Complex, trying to make good on Chance&apos;s recent challenge to "do your jobs"—piled into the small library at Westcott Elementary School on 80th Street in Chance&apos;s old Chatham neighborhood. 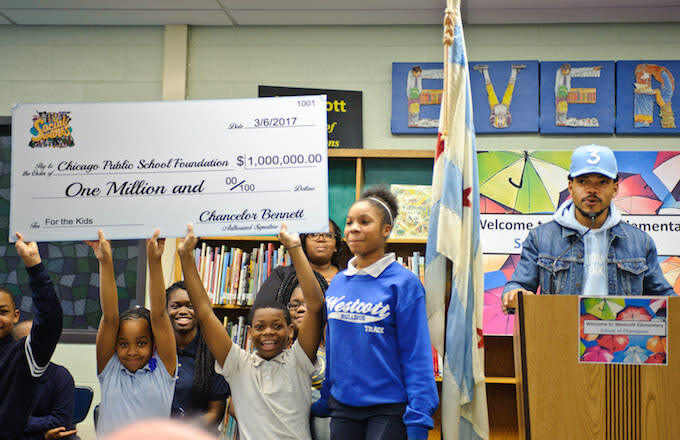 Chance spoke in front of a backdrop of books, flanked by the eighth grade officers, honor roll students, and a few lucky kids plucked at random ("We had to do a lottery just because it happened so fast," Principal Dockery explained). The rapper spoke slowly, with uncharacteristic shyness, as if new to public speaking, but his words were confident: "This isn&apos;t about politics, this isn&apos;t about posturing. This is about taking care of the kids." He proceeded to donate one million dollars to Chicago Public Schools—in an effort to lessen its $215 million budget shortage—and $10,000 to Westcott Elementary School in particular. This amount, Principal Dockery said, would go toward the school&apos;s Academic After School and Enrichment programs, which were due to be cut after the Chicago Public Schools were faced with a budget freeze, and Westcott—a "Level One," meaning top performing—was set to lose $75,000 in funding. All Chicago Public Schools, in an effort to save $96 million dollars, may soon cut summer school and the last three weeks of the school year. Yet what was most interesting about Chance&apos;s stunt wasn&apos;t the money he put forward—as many have pointed out, plenty of celebrities have donated money to various causes in the past in an effort to help Chicago kids—but the way he did it. Chance is, I have long maintained, a canny political operator, despite his performance of relative naïveté. 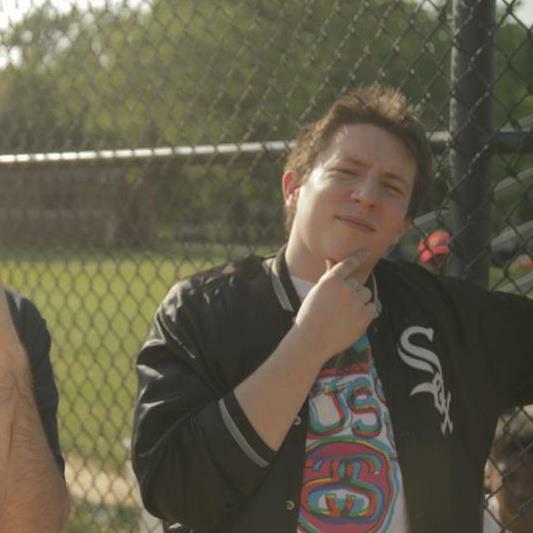 For an artist whose father works in politics, and whose origins in Chicago&apos;s activist poetry scene draw directly upon principles from grassroots organizers like Saul Alinsky, the actual money he&apos;s donating isn&apos;t the point, nor is it merely measurable in PR value. The money is there to back up his wider purpose. He&apos;s putting his full weight behind the issue in an effort to genuinely make a difference in a political morass—and to enjoin others to put up as well. The million dollar donation was raised in conjunction with AEG Live, LiveNation, and various independent promoters and venues, and Chance explicitly challenged other corporations to get on board and help pick up the tab for the city&apos;s schools. The donation and press conference were also an explicit challenge to Illinois Governor Rauner. For those unfamiliar with Illinois politics, the way the state got here is complicated, and has a lot to do with an ongoing conflict over the state&apos;s pension crisis. Last year, the legislature and Rauner nearly came to an agreement that—Rauner claims—would have allowed the state to alter teacher&apos;s retirement payouts, against the wishes of the teachers&apos; unions and the Democrats who support them, in exchange for passing a budget which would cover schools. According to Rauner, the Democrats reneged, and so he refused to pass the budget. This game of chicken between Democrats and Republicans, though, only harms the children in the Chicago Public School system, and points to the real problem at the heart of Rauner&apos;s willingness to let the schools go unfunded: he doesn&apos;t need to care. And he doesn&apos;t need to care because he wasn&apos;t elected by Chicago, but by the wider, whiter state. Illinois public schools have the biggest funding gap in the nation. Per student, according to the Chicago Tribune, $10,343 is spent on education. Yet that&apos;s averaged out among students from wealthy communities, working class communities, and impoverished ones. Illinois education funding is based around property taxes, meaning that poor communities end up with extremely underfunded schools, even if they&apos;re well-performing schools like Westcott, while suburban communities with wealthier students have resources that go beyond textbooks and after school programs to include extravagances like pools and climbing walls. The origins of this imbalanced funding formula are segregation and racism, the legacy of "separate but equal," and is the real violence at the heart of "the violence in Chicago." Rauner is currently gambling that white Illinois would rather watch Chicago public schools be defunded than think about sharing their largesse with the mostly black and Latino CPS. This is typically an unspoken truth, but it&apos;s also one Chance is challenging Governor Rauner to own out loud. Rauner would cast himself as the hero of a noble effort to balance Illinois&apos; budget responsibly, to face down the unions that operate as a drain on state funds. Yet he&apos;s accepted the education of Chicago students as collateral damage, and is depending on the racist antipathy so many in the state have towards them to shield him from the political consequences. Chance&apos;s challenge isn&apos;t merely to Rauner, either; after all, he&apos;s one man trying to fumble with system that was broken long before he arrived. Democrats in Illinois are hardly blameless. And likewise, Chance&apos;s argument—"do your job"—was also laid at the feet of the media. In the press conference, a member of local TV news tried to spin his story to suggest this was about getting celebrities to step it up. Chance acknowledged he was also challenging influential people, but his challenge to corporations pointed to how he&apos;d exacted a price from companies he works with—AEG and LiveNation—in an effort to confront this issue. Chance claimed this wasn&apos;t about politics, and in the sense that he doesn&apos;t want to become embroiled in a complex pension debate in Springfield, this makes sense. Yet this donation was not about good PR, nor was it about a charitable deduction at tax time. He is growing to become a savvy political force, and this was Chance leaning on the levers of power. He&apos;s challenging everyone to do their jobs—in the media, to speak the truth. For those who work with major corporations, to push them to acknowledge their responsibility to students in Chicago. Perhaps if you&apos;re a Chance fan from Wilmette, or from Lake County, the pressure should be on to recognize your complicity in a society that enjoys the culture of Chatham, but wants to defund the very schools in that neighborhood. This isn&apos;t about celebrities, and it&apos;s not about Governor Rauner; everyone needs to do their job. "Everybody and their momma knows about what&apos;s going on in Chicago, it&apos;s constantly talked about," Chance said. "But we&apos;re about to enhance the conversation."